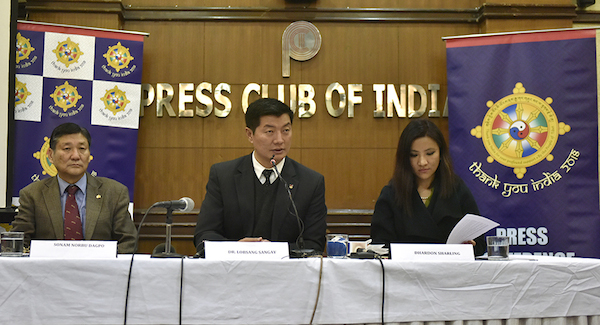 (TibetanReview.net, Jan27, 2018) – The Central Tibetan Administration at Dharamshala, India, has on Jan 26 announced its calendar of events for marking 2018 as ‘Thank You India’ year beginning from Mar 31. The day marks the completion of 60 years since Tibet’s then temporal and spiritual leader, His Holiness the Dalai Lama, set foot on Indian soil to seek asylum, joined by some 80,000 Tibetans over the coming days. Mar 31 will see the culmination in New Delhi of a Peace March begun on Mar 17 from Chuthangmo/ Khenzimani in Arunachal Pradesh by a symbolic group of 60 Indian friends. The day will see the Dalai Lama lead an interfaith prayer meeting of religious leaders at Rajghat. Those participating in the prayer meeting will include 113 Tibetan Buddhist monks and nuns in a symbolic representation of the number of years the Dalai Lama expects to live. A ‘Thank you India’ public event will be held in the Thyagaraj Stadium, New Delhi, with the participation of the Dalai Lama and Indian dignitaries on Apr 1. This will be followed by a three-day ‘Thank you India Tibet Festival’ held at the India International Centre, New Delhi. There will also be a Three-day ‘Thank you India Little Tibet Festival’ to be held from Apr 5 to 7 at Delhi Haat. On the Tibetan Buddhists’ most auspicious religious festival of Saka Dawa (marking Buddha Shakyamuni’s birth, enlightenment and passing away, which this year falls on May 29, Tibetan monasteries and nunneries across India will observe a ‘Pray for India’ event. Monks and nuns, along with leaders of the different religious traditions and faith, will pray for India’s success and for the well-being of the Indian people. On the World Environment Day of Jun 5, Tibetans in India will engage in a mass tree plantation drive under the theme of ‘Toward a Green India’. On the UN-declared International Yoga Day of Jun 21, Tibetans in India will take part in Yoga Day events organized by the Ministry of Ayush, Government of India. On the occasion of the 83rd birthday of His Holiness the Dalai Lama on Jul 6, Tibetans across India will feed the hungry and the homeless under the theme of ‘Feed the Hungry’. Swach Bharat, an initiative of India’s Ministry of Drinking Water and Sanitation, will be marked by Tibetans in India on Oct 2 with a mass cleanliness drive. And on the World Human Rights Day and the 29th anniversary of conferment of the Nobel Peace Prize on His Holiness the Dalai Lama on Dec 10, Tibetans across India will distribute blankets and warm clothes to the homeless.